The BLH Nobel brand of Vishay Precision Group, Inc. (NYSE: VPG) (www.blhnobel.com), experts in standard and custom process weighing and force measurement solutions, including high-quality and high-accuracy weighing and control systems, today announced the availability of its high-precision force sensors and load cells for construction, mining, and off-highway vehicle onboard weighing systems. Rugged BLH Nobel static load cells and force sensors offer highly accurate and precise real-time transported load monitoring and measurement capabilities. When integrated into associated vehicle onboard weighing systems, collected load cell data can help operators to prevent unwanted overload and underload conditions. Overloading, as a common source of excessive vehicle wear and tear, can lead to costly repairs and unwanted downtime. Alternately, underloading can create performance and fuel usage inefficiencies, while increasing a vehicle’s emissions and overall carbon footprint. To address these challenges, BLH Nobel offers load cells in a variety of sizes, and standard ranges from 1 kN to 20 MN. Their low-profile designs allow for seamless integration into in-vehicle cabin onboard weighing systems, as well as associated communications and specialty software. 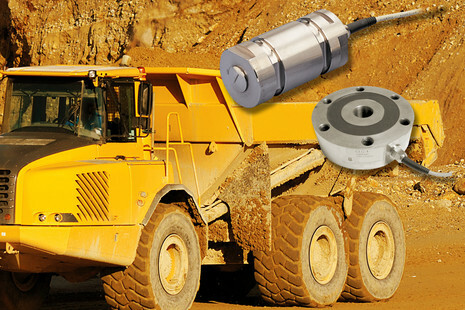 Most load cells are available with ATEX, FM and CSA approvals for mining and explosive atmospheres. Select models may be further available with functional safety certifications. Please consult BLH Nobel for details. For more than 40 years, the BLH Nobel brand of VPG has specialized in the design, development and manufacture of high-quality and high-accuracy process weighing and force measurement technologies and related control systems. BLH Nobel load cells maximize accuracy and minimize the effects of mixing, agitation, and temperature changes within critical process stages. BLH Nobel products and customized solutions are designed to comply with stringent requirements in the food and beverage, pulp and paper, pharmaceutical manufacturing, medical equipment, process, mining, steel, and offshore industries. All BLH Nobel force sensors and load cells are produced at the company’s state-of-the-art manufacturing facility in Degerfors, Sweden. Each product undergoes extensive testing prior to shipment, ensuring its full conformance to quality and performance specifications, as well as any relevant industry legislative and safety standards. The brand further offers a variety of communication protocols for seamless integration within complex production lines. It supplies its system solutions, products, and services in more than 100 countries worldwide. Each BLH Nobel custom solution is derived from more than 40 years of engineering expertise, gained from across thousands of successful applications. For more information about BLH Nobel and its available product offerings, visit www.blhnobel.com. VPG's BLH Nobel brand is a world leader in process weighing and force measurement, producing high-quality and high-accuracy weighing and control systems. BLH Nobel load cells maximize accuracy and minimize the effects of mixing, agitation, and temperature changes in critical process stages. The brand´s products and customized solutions are designed to comply with stringent requirements of the pulp and paper industry, as well as process, mining, steel, and offshore industries. BLH Nobel offers a wide variety of communication protocols used in complex production lines and supplies system solutions, products, and services in more than 100 countries around the world.